As a public service announcement, I will warn you about this... thing. 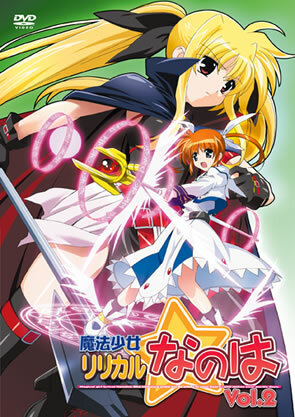 Magical Girl Lyrical Nanoha is a magical girl franchise aimed at adult male otaku and it likes FIGHTS!!! It characterises its heroines as nice, sweet, caring schoolgirls. It then makes them have lots of FIGHTS!!! They love it! This was taken to its ultimate conclusion in Vivid, which was about a martial arts tournament and portrayed its heroines as being incapable of saying or thinking about anything that wasn't FIGHTING!!! If you put them in a room with a book, their brains would fail. They'd probably start a fight with a mirror or something. This episode starts well. I paused it to double-check that I wasn't watching the wrong thing. A girl is being bullied by boys. She starts beating them up, only to end up in hospital and discover that employers and the police don't like gratuitous violence. Don't watch this show. As a survivor of nearly all Nanoha to date, I'm warning you for your own good. Don't even try it out of curiosity. It's not "so bad it's good". Once it gets into fighting mode, it's just dull and monotonous.